Cheng Shifa (1921-2007) acquired a reputation as an accomplished book illustrator and figure painter. However, he showed more interest in flower and bird paintings in his later years and published a volume of this genre in 1979. 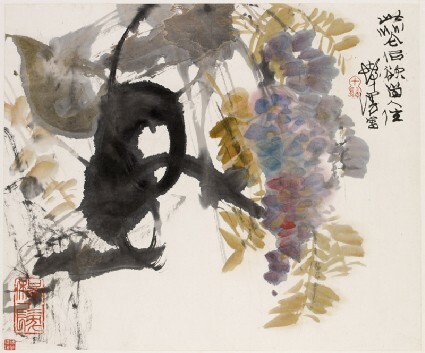 The three leaves displayed here [EA1995.175.i, EA1995.175.b, and EA1995.175.l] are from an album [EA1995.175] painted around that time, demonstrating looser brushwork than his figure paintings. Native to Central China, wisteria sinensis was first introduced to Britain in 1816 by John Reeves, the Chief Inspector of Tea at Canton in southern China. Wisteria has been a favourite of British gardeners since then. In Britain, the plants had flowered as early as 1819 and cuttings were selling for about six guineas each. By 1835, wisterias were so common in Britain that they sold for less than two shillings. Yet in China wisteria was not mentioned or praised in literature as much as other garden plants. It may be because wisterias are twining climbing vines, which have often been regarded as similar sycophants who attach themselves to people in power.